A woman has been killed in an apparent hit-and-run outside a caravan park in Doncaster. The 52-year-old was struck by a car at the entrance of Whitegates Caravan Park on Station Road, Dunscroft, shortly before 13:50 GMT on Friday. 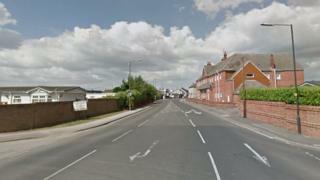 She was pronounced dead at the scene and the vehicle had "left the area", South Yorkshire Police said. Two teenagers, aged 17 and 19, have been arrested on suspicion of murder and remain in custody. A red Citroen Berlingo has been recovered and officers want to speak to anyone who saw it being driven between Dunscroft and Wadworth after the crash.